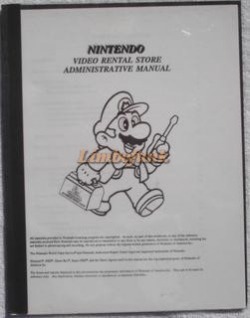 This manual was given to businesses that wished to participate in the Video Rental Store Program that was being offered by Nintendo at the time. Local rental stores could be recruited by Authorized Service Centers to be used as locations for customers to drop off and pick up their Nintendo Products that needed to be repaired or replaced. This gave customers the chance to interact with Nintendo's Customer Service Program in a less obtrusive manner. The manual itself goes into detail about what the program entails, including product warranty information, service plans, the power swap program, customer issues, forms that would need to be processed as well as a few other points.